Within Apple’s hallowed halls, the Apple TV’s status seems ever-changing. One minute it’s a hobby. The next, because of greater availability of media in the form of iTunes movie rentals, it’s less hobby and more avocation. And then when movies don’t come as quickly to the iTunes Store as Apple would like and sales of the Apple TV fail to take off, in part, because of this lack of content, back to hobby status goes the smallish set-top box. And in the meantime, the lack of new features and system updates makes one wonder if Apple’s set it sights on a brighter and better Something Else. Given that, who can blame owners of these devices for wanting to take measures into their own hands and enhance the Apple TV in ways not sanctioned by Apple? Certainly not me, as I’ve altered my Apple TV so that it can stream video from Comedy Central, YouTube, CNN, MySpace TV, and NBC’s Hulu; stream audio from the BBC, Last.fm, and SHOUTcast; display pictures from Flickr and PicasaWeb; and access content on computers on the same network as my Apple TV. And you can too. Let me show you how. 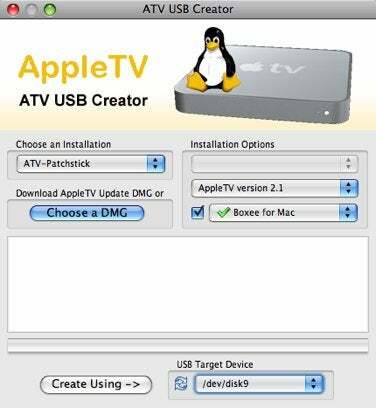 • ATV USB-Creator, an open-source utility that will flash a USB flash drive with utilities that, when added to the Apple TV, expand its capabilities in wondrous ways. • A 512MB or larger USB flash drive. Plug in a USB flash drive, download and launch ATV USB-Creator. In the ATV USB Creator window that appears, choose ATV-Patchstick from the Choose an Installation pop-up menu and Boxee for Mac from the Installation Options pop-up menu. From the USB Target Device pop-up menu, choose your USB flash drive (/dev/disk9, for example), and click Create Using. ATV USB Creator will download a necessary disk image and then install its contents on the USB flash drive. Unplug the Apple TV and jack the USB flash drive into the Apple TV’s USB port. The magic that’s now on the USB flash drive can be installed on your Apple TV only by the Apple TV accessing the flash drive when it first boots. For this reason, unplug the Apple TV’s power, plug the USB flash drive into the Apple’s TV’s USB port, and then plug the Apple TV’s power plug back in to power up the device. When you do, you’ll see strings of text. This is normal and indicates that the flash drive is installing the necessary components on the Apple TV. Note: Be sure that the text reads Please unplug your Apple TV to reboot/reset the device when it finishes (this appears about four lines up from the bottom of the screen). Some USB flash drives are incompatible with ATV USB-Creator. You’ll know if the installation was unsuccessful if you don’t see this message. And if you don’t see that message, DO NOT TRY AGAIN. Your Apple TV is now in a twilight state where some of the ATV software is on the Apple TV. If you attempt to install it again without restoring the Apple TV to factory condition (Settings/General/Reset Settings), you’ll likely be unable to boot the Apple TV. If your installation attempt failed, try ATV USB-Creator with a different flash drive after restoring the Apple TV to factory condition. Pull the Apple TV’s power plug. Pull out the Apple TV’s power plug to turn it off, remove the USB flash drive, and plug the Apple TV back in. Update Boxee Launcher. When the Apple TV boots you’ll see separate commands for XBMC and Boxee (XBMC is another media browsing application installed in the process). Choose Boxee and then the Update command that appears to the right. Within that Update screen choose to update the Boxee Launcher. The Apple TV will quickly download the update and then reset the Apple TV. Update everything else. After the Apple TV resets you’ll see a single XMBC/Boxee command in the main menu. Select it, choose Update on the right side of the screen, and update everything offered on the succeeding screen. The XBMC and Boxee updates take several minutes to download so be patient. For some updates the Apple TV will reset. Others ask that you press Menu on the Apple Remote to proceed. Log into Boxee. 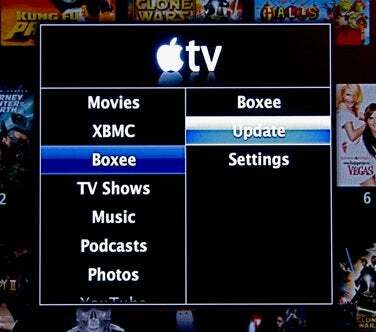 Your Apple TV is now configured to use XBMC and Boxee. Select Boxee and press the remote’s Play/Pause button. You’ll be prompted to enter your Boxee username and password. Do so using the onscreen keyboard and Boxee should soon start. Once in Boxee you can add networked sources for movies, audio files, and pictures—the Public folder on your Mac, for example—as well as access Internet videos sources such as those I listed above. A final note. Boxee is alpha software and its implementation on the Apple TV is imperfect. When using Boxee on my Apple TV it quit unexpectedly more than once. Fortunately, removing it is no more difficult than restoring your Apple TV to its factory settings.